The phonon contribution to the thermal boundary conductance (TBC) at metal–metal interfaces is difficult to study experimentally, and it is typically considered negligible. In this study, molecular dynamics simulations (MDS), employing an embedded atom method (EAM) potential, are performed to study the phonon contribution to thermal transport across an Al–Cu interface. The embedded atom method provides a realistic model of atomic behavior in metals, while suppressing the effect on conduction electrons. In this way, measurements on the phonon system may be observed that would otherwise be dominated by the electron contribution in experimental methods. The relative phonon contribution to the TBC is calculated by comparing EAM results to previous experimental results which include both electron and phonon contributions. 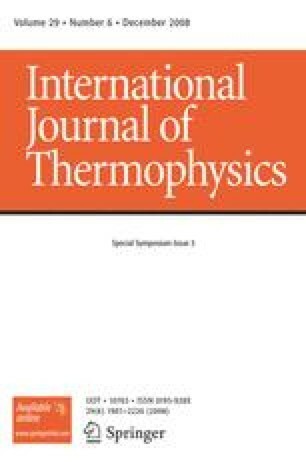 It is seen from the data that the relative phonon contribution increases with decreasing temperature, possibly accounting for more than half the overall TBC at temperatures below 100 K. These results suggest that neglect of interfacial phonon transport may not be a valid assumption at low temperatures, and may have implications in the future development of TBC models for metal interfaces.